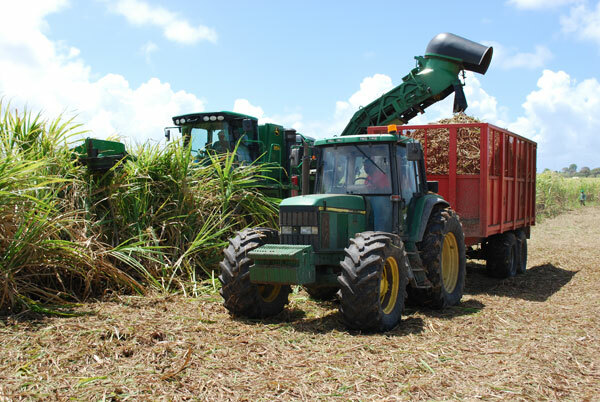 Cane sugar harvesting in Guadeloupe. Global trading and consumption of sugar is now at record levels as consumers have reacted to lower prices. Refined sugar has been price competitive with High Fructose Corn Syrup, which has resulted in the increased usage of sugar on the world market. The estimated global sugar production surplus for 2013/14 is 2 million tonnes from a total production estimate of 181.8 mln tonnes. This figure is lower than predicted earlier in the year as a result of production problems in Brazil and lower beet sugar production in Europe, although southern hemisphere crops of Australia and South Africa have seen significant improvements. The sugar market is now close to equilibrium for supply and demand, but prices have now fallen below the costs of most of the world’s producers, so current prices will become unsustainable over the next 12 months. The cold start to the year followed by a wet spring caused slow germination and initial growth resulting in sucrose yields below the five year averages. The sustained good weather during the summer months has significantly improved the growth and sugar content of the beets and if these conditions continue through September, the crop should regain from the slow start earlier in the year. Either way, production quotas will be achieved. Extra replanting of cane had expectations of an increase in cane availability, but since the beginning of the crop heavy rainfall hit the centre-south region from May until July, which disrupted the cane harvesting. The result will see harvesting into the tail end of the crop, with the possibility of cane being stood over until the 2014/15 season. Crushing is currently at its peak, although frosts in the south of the country have resulted in reduced cane and sucrose yields. The forecast for the 2012/13 crop is 585 mln tonnes, producing 34.1 mln tonnes of sugar. Currently 47.8% of cane crushed goes towards sugar production, low ethanol prices of 16 cents/lb should result in more cane being diverted to sugar production. An estimated third consecutive year of record production for the 2013/14 crop will improve on last season’s 100 mln tonnes of cane that produced 10 mln tonnes of sugar, now that the rainy season has ended. Cane irrigation has been limited in Maharashtra as the monsoon eased, although an abundance of rain continues in Uttar Pradesh. Overall the monsoon season has had a positive effect on cane yields. The estimated sugar production for the 2013/14 crop stands at 25.8 mln tonnes. The devaluation of the Rupee should result in mills exporting sugar onto the world market. A rise in planted acreage and an early start to the monsoon season has improved yields to new highs and a bumper crop for 2013/14 is expected. Recent flooding may result in the estimated production of 5.7 mln tonnes of sugar not being produced, although the harvest is likely to exceed last season’s 4.8 mln tonnes. Like India the weak Rupee should result in mills exporting sugar onto the world market. The harvest continues to perform well with an estimated increase of 20% over last season. The industry is expected to produce 2.57 mln tonnes of sugar from the 2013/14 crop. The excellent crop has reduced domestic prices which have further reduced due to Brazilian white sugar imports, resulting in the industry claiming to make a loss selling sugar at world market prices. The estimates for the 2013/14 crop is expected to produce 4.47 mln tonnes sugar, similar to last year’s tonnage as the harvest approaches the halfway mark. Much of the country is experiencing ideal crushing conditions due to the dry weather since June, which has improved the sucrose content. USDA is lowering its projection for domestic sugar beet production this season following double the normal rainfall levels in May/June, followed by 76% below normal rainfall in July/August, reducing beet yields. Mexico’s cane crop suffered from a very dry July/August, although rains at the end of August should improve the prospects for the 2013/14 production, which is estimated at 6.8 mln tonnes of sugar.